MATCHBOOK DISCOUNT: If you purchase the Paperback version of this book, you can purchase its Kindle version for FREE! Paperback version must be purchased from Amazon. "Don't wish for a life that you can't have. But wish for the very life that you do own. And wish that you know how to make the most of it!" Do you have friends or relatives who are in much trouble, stress and negativity that you'd like to assist their ways, ignite their hearts, and pull them out of dark days? 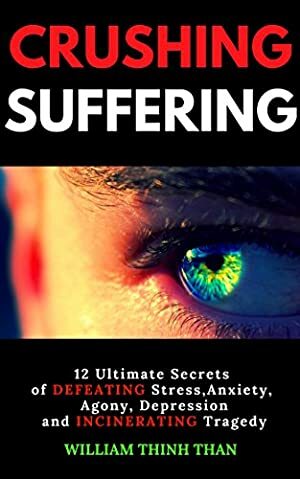 "Crushing Suffering" will help inspire your day and excite your way. It will walk with you in darkness. It will befriend your heart, lead you out of sufferings, and let you know how courageous you can really be. Everybody has to deal with life's ups and downs, negative feelings and situations from time to time. No exception! Hate and anger, danger and worry, anxiety and distress, you can let them obsess your life and tear your soul apart. Or you can choose to fight hard and bounce back, and regain happiness from those dark days. - Overcome pain and grief, fear and stress, worry, anxiety and depression. - Deal with difficult problems and difficult people. - Take charge of every feeling and action. - Fill up your energy and vitality. - Regain your strength and happiness. - Fall in love with your heart and your life. - Revive the joy and passion of it. - Inspire and excite this day to the utmost with extreme survival stories and inspiring life quotes. - Be your boldest self to challenge challenges, defeat difficulty and incinerate any ache that comes. No matter how bad and how sad things have been to you, life will not be hopeless. No matter how much fear and stress, regret and worry, agony and mishap have afflicted your way, you'll not walk alone. Track It. This book has been $0.00 within the past 90 days. Log In to track William Thinh Than on eReaderIQ. to be notified each time the price drops on any book by William Thinh Than. to stop tracking William Thinh Than. We started tracking this book on December 5, 2018. The price of this book has changed 8 times in the past 139 days. The current price of this book is $5.99 last checked one day ago. The lowest price to date was FREE last reached on April 1, 2019. The highest price to date was $5.99 last reached on April 1, 2019. This book has been $5.99 4 times since we started tracking it. We last verified the price of this book about one day ago. At that time, the price was $5.99. This price is subject to change. The price displayed on the Amazon.com website at the time of purchase is the price you will pay for this book. Please confirm the price before making any purchases.